White paper on crime 2004 Part1/Chapter2/Section2/2. Fig. 1-2-2-1 shows the numbers of cases and persons cleared for non-traffic penal code offenses(excluding unsafe driving resulting in death or injury in traffic accidents;hereinafter the same in this subsection)committed by foreign nationals since1980. 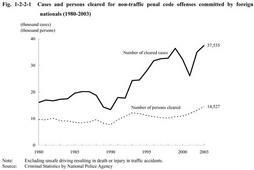 Cleared cases for non-traffic penal code offenses committed by foreign nationals decreased for two years after a1999peak,but rose in2002and reached a record high of37,535in2003.Foreign nationals cleared have increased since1999to a record high of14,527in2003.In2003,the total number of persons cleared for non-traffic penal code offenses was379,602,3.8%of which were foreign nationals,the same level as2002. Fig. 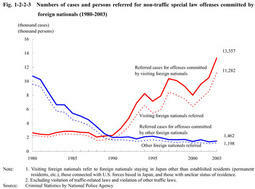 1-2-2-2 shows the numbers of cases and persons cleared for non-traffic penal code offenses committed by visiting foreign nationals and by other foreign nationals since1980.Visiting foreign nationals are defined,in the Criminal Statistics by the National Policy Agency,as foreign nationals staying in Japan other than established residents(permanent residents,etc.,those connected with U.S.forces based in Japan,and those with unclear status of residence). Cases and persons cleared for non-traffic penal code offenses committed by visiting foreign nationals have increased since1980.Visiting foreign nationals have exceeded other foreign nationals in the number of persons cleared since1991and in the number of cleared cases since1993.In2003,cleared offenses committed by visiting foreign nationals increased by3,000(12.4%)from2002to27,258,and those nationals cleared also increased by1,035(13.5%)from2002to8,725,both reaching record highs since1980. Fig. 1-2-2-3 shows the number of cases and persons referred for special law offenses(excluding violations of traffic-related laws and violations of other traffic laws)committed by visiting foreign nationals and other foreign nationals since1980. Cases and persons referred of other foreign nationals continued to decrease until1990and remained almost flat since then,whereas those cases of and persons who were visiting foreign nationals have been on the rise and exceeded other foreign nationals both in cases and persons in1990.In2003,referred cases committed by visiting foreign nationals increased by2,869(27.4%)from2002to13,357and referred persons also increased by2,760(32.4%)from2002to11,282,both reaching record highs since1980. 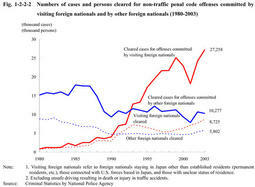 The trend in major types of offenses committed by visiting foreign nationals is outlined as follows. Fig. 1-2-2-4 shows the number of cleared theft cases committed by visiting foreign nationals over the last10years. Cleared theft cases continued to rise,and decreased for two years after a1999peak.They rose again from2002to a record high of22,830in2003,increase by2,226(10.8%)from2002.By modus operandi,vehicle theft has been relatively small in number recent years,and non-invasive theft has fluctuated,whereas invasive thefts have risen remarkably by1,728(25.6%)from2002to8,482in2003. Fig. 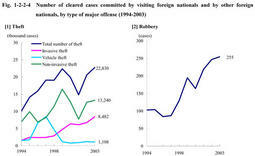 1-2-2-4 shows the number of cleared robberies committed by visiting foreign nationals over the last10years.In2003,it reached a record high of255. Fig. 1-2-2-4 shows the number of cleared Immigration Control Law violations committed by visiting foreign nationals over the last10years. Immigration Control Law violations temporarily declined after a1997peak,but rose again since2001to a record high of10,550in2003,increase by2,560(32.0%)from2002.By type of violation,in2003,illegal overstay was the largest with5,818cases,followed by illegal stay with2,638cases,non-possession of passport/refusal to show passport with1,266cases,and illegal entry with423cases.Illegal stay,which was newly established upon the amendment to the Immigration Control Law in1999(entry into force in February2000),have increased every year from296in2000to2,638in2003(Source:Data by Criminal Investigation Bureau,National Police Agency). Persons cleared by the police or Maritime Safety Agency for group stowaway incidents rose sharply from324in1995to679in1996and1,360in1997,and then have fallen to139in2003(Source:Data by Criminal Investigation Bureau,National Police Agency).This may be due to the amendment to the Immigration Control Law in May1997(entry into force in the same month).Upon this amendment,for the purpose of responding to the sharp increase of group stowaway incidents in which international human trafficking groups such as"the Snakeheads"were involved,the offense of group stowaway was newly established and regulations against those who encourage or support group stowaway was tightened.The number of persons referred for group stowaway has been below100after a peak at153in1998,and stood at63in2003(Source:Criminal Statistics by National Police Agency). In order to decrease the number of foreign nationals who illegally stay in Japan,the Immigration Control Law was amended to strengthen penalties in2004(entry into force in December,2004). Fig. 1-2-2-4 shows the number of cleared cases of violations of drug-related laws and Anti-Prostitution Law committed by visiting foreign nationals over the last10years. 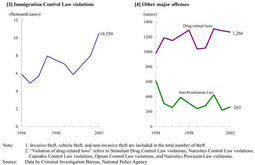 Cleared cases of violations of drug-related laws have been over1,000since1995,coming to1,266in2003.Cases for Anti-Prostitution Law violations were263in2003.